Welcome to the Spellbinders Cut and Emboss Blog! Today a few friends and I are showcasing these AMAZING new embossing folders that have a fun feature....they also add little cuts. Its is such a fun look for a quick and easy card design. To create this card, I ran the Floral Reflections Emboss and Cut Folder through my Spellbinders Platinum 6 machine. This produced the most amazing, detailed, embossed panel with small circle cuts on each flower. I added this panel to a piece of yellow card stock so it would show through the flower centers on the front. After adhering the 2 panels together, I added a leaf and flower die cut from the Floral Four Die Set. I added a small yellow Nestabilities Classic Rectangle Die cut with a heat embossed sentiment, right in the center of the embossed panel. I filled each flower center with Glossy Accents for some shine. Super easy to put this card together! There are more Cut and Emboss folders to see. You can check them out by clicking HERE. To celebrate this release, we are giving away a $50 gift certificate to a lucky blog reader – selected from the comments across all of the blogs in the hop. Giveaway closes on Sunday, April 14th 11:59 pm EDT. Winners will be announced in our blog hop post the following Monday. The winner is responsible for shipping cost, duties, and taxes. Thank you so much for coming by today! Hope you have a great ay! Very pretty! You are so creative! I love this sweet card and could see the design used for several different occasions! I like how you backed the cut and embossed panel with a bright yellow to all just a hint of color to show through! These background are just so pretty. I used your link and checked out other of these cut and emboss folders..found one that was just what I would love...called Flower Garden. Spellbinders has some really beautiful products. Thank you Laurie for that link and for sharing your beautiful card. Great card! Love all the dimension and the pop through of color. These go on my wish list! Love these cards. Beautiful creations. Such a lovely card!! I am awaiting for my new spellbinders kit to be delivered today! Thank you! Beautiful card. The embossing is perfect for this card. Love your choice of the white background with the delicate details of the embossing folder. Love dimension in cards, gives so much life and interest. What a beautiful card you crafted! I love the idea behind these new folders! Enjoy your weekend! Love the simplicity of your card - thanks for sharing! 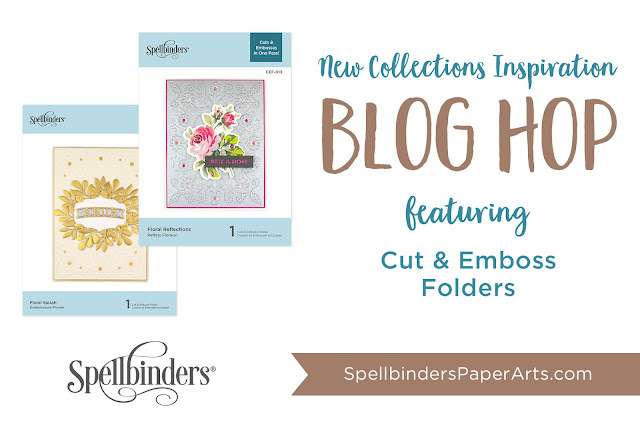 These new Cut & Emboss folders are special. The card you created is simply stunning. Thanks for sharing. Love your beautiful card, Laurie! 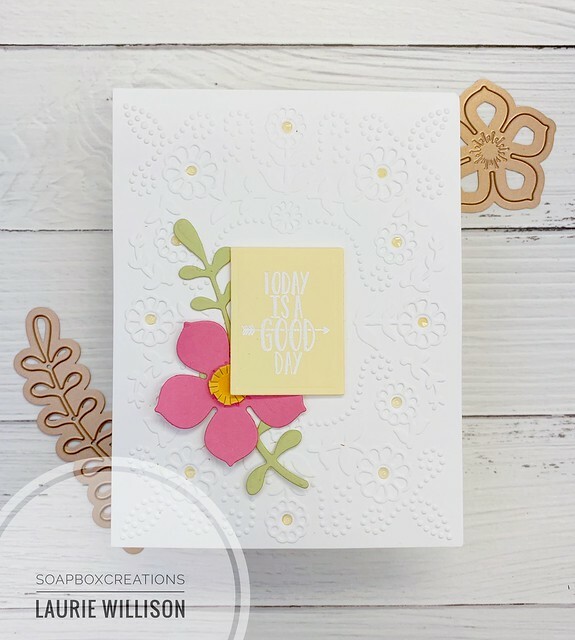 The cut and emboss folder is so pretty on its own, but the addition of the flower/leaf spray combo and the sentiment makes for such a lovely creation. Lovely card. The cut and emboss folder makes it easy to create such lovely projects. Thanks for sharing, I love how you added the die cuts after you cut and embossed. Very pretty card, love the touch of yellow in the center of the flowers. Your card is sweet and simple. Oooh, that Cut and Emboss card background reminds me of the sweet eyelet lace dresses my mom used to sew for me as a girl. You have to love these cut and emboss folders! Pretty card. Love the soft one on your lovely card. Love how the yellow paper pops through the centers of the flowers on the front. Lovely card! Love your clean and simple card. TFS. Very pretty Laurie. The white background looks very elegant... sweet die-cut flower! Love the hot pink. Such a lovely card! These new folders make it easy for a craftwr to have professional results no matter the skill level. Amazing! Thank you! Such a pretty,neat and elegant card...thanks for sharing!! Pretty card. Spellbinders makes it so easy to create! Such a pretty card, and I love the lacy background with this pink flower! Love this pretty Cut & Emboss design! Beautiful card! I have many Spellbinders but have to admit I'm not familiar with the cut and emboss folders. Now I'm sold -- your card is gorgeous.